American Bonded is a neighborhood bar named for the Bottled-in-Bond Act of 1897. 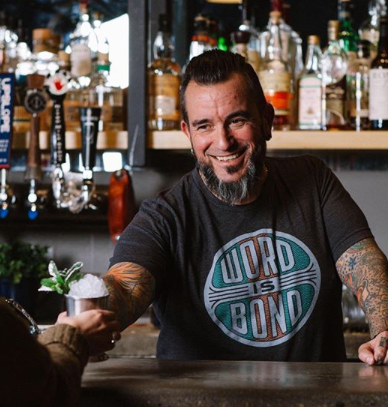 It’s namesake legislation insured quality and defined American Whiskey and in turn, American Bonded provides a high quality experience while highlighting the congeniality and craft of the bartender. American Bonded offers a wide range of spirits, cocktails, beer, wine at reasonable prices. As well, our kitchen-in-residence, True West Kitchen, offers delicious food until the wee hours of the morning (1am). While American Bonded may have a Whiskey focus, our greater goal is that our guests leave happier and more fulfilled than when they initially walked through our doors. Favorite quote: "I am not a saint, unless you think of a saint as a sinner who keeps on trying"
Favorite thing about the bar business: Seeing people leave happier than they came in. Things you should know: Better known as Vedo. Pisces. Likes long walks on the beach and described by many as wicked awesome.